When Does a Lawyer Violate California’s Ethical Duty of Competence? 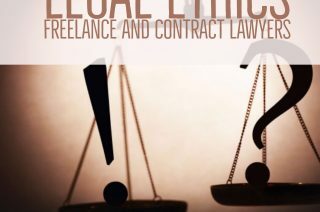 Questions regarding the legal ethical “duty of competence” can arise when law firms outsource legal work to freelance/contract attorneys. Section 6067 of the California Business … [Read more...] about When Does a Lawyer Violate California’s Ethical Duty of Competence? Does a Law Firm Need to Tell Their Client If They Are Using A Contract Lawyer or Freelance Lawyer? 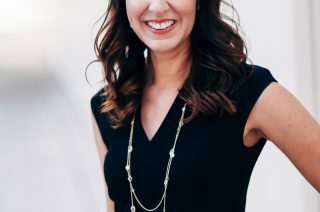 Law firms often resist using freelance lawyers under the mistaken belief that they always have to notify their clients if they are using a freelance attorney. California rules are … [Read more...] about Does a Law Firm Need to Tell Their Client If They Are Using A Contract Lawyer or Freelance Lawyer? Does Engaging an Out-of-State Freelance Lawyer Not Barred in California Violate Any Ethical Rules? 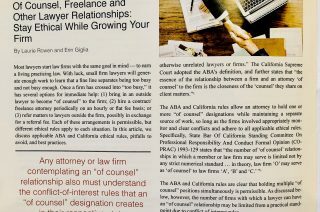 Should California law firms be concerned about violating ethical rules prohibiting aiding and abetting in the unlawful practice of law when they use an out-of-state freelance … [Read more...] about Does Engaging an Out-of-State Freelance Lawyer Not Barred in California Violate Any Ethical Rules?